South Indian Bank PCs /Probationary Clerks Recruitment 2017/South Indian Bank PCs /Probationary Clerks Recruitment, admit cards, results 2017: South Indian Bank Ltd has published the Probationary Clerks Recruitment 2017 notification. Applications are invited for filling up vacancies of Probationary Clerks for branches in various States under Bank’s Regions. Eligible candidates are requested to apply ONLINE through Bank’s website www.southindianbank.com. No other means/modes of applications will be accepted. Before the registration, candidates are requested to ensure that there is a valid email id in his/her name. 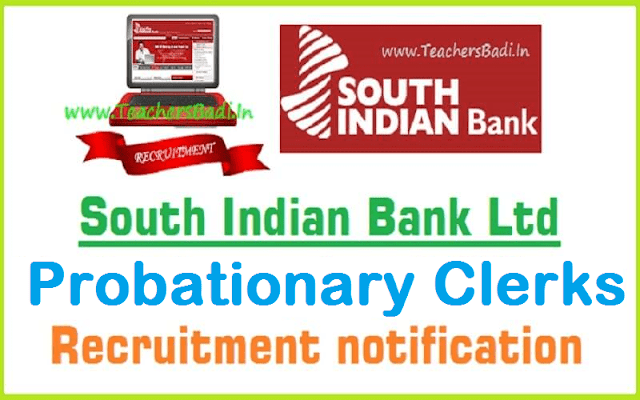 South Indian Bank has invited applications from graduates for recruitment to the post of probationary clerks. A total of 468 posts are open for recruitment for the branches/offices in Kerala, Tamil Nadu, Andhra Pradesh, Telangana and Delhi NCR. Online applications can be submitted till 30 December 2017 and online test will be held in January 2018. Official recruitment advertisement is available at the website southindianbank.com. Candidates must be 'less than 26 years as on 31.12.2017. Candidate should be born not earlier than 01.01.1992 and not later than 31.12.1997 (both days inclusive). Upper age limit will be relaxed by 5 years in the case of SC/ST candidates,' reads the advertisement about the age limit criteria. In addition to the above mentioned criteria, those having permanent address in the respective state or those who have been residing in the same state continuously for the last 5 years and are proficient in local language apart from English only are eligible to apply. Language proficiency in any of Malayalam, Tamil, Telugu, Hindi is essential apart from English. 'Candidate should have passed X, XII and Graduation under regular course (full time course) from a recognised University/ Institute recognised by the Govt. of India. Educational qualification by mode of distance education will not be considered.' Candidates shall have to apply online along with application fee of Rs. 600 (Rs. 150 for SC/ ST category). - Candidates who are meeting the requisite educational qualification as on 31.12.2017 only will be eligible to apply. Not more than 26 years as on 31.12.2017. Candidate should be born on or after 01.01.1992 and on or before 31.12.1997. Upper age limit will be relaxed by 5 years in the case of SC/ST candidates. Candidates selected as probationary clerks will be recruited for a 6-month probation period and the confirmation is subject to candidate’s performance during this period. Candidates will fall in the pay scale range of ₹11765 – 655/3 – 13730 – 815/3 – 16175 – 980/4 – 20095 – 1145/7 – 28110 – 2120/1 – 30230 – 1310/1 - 31540. Depending on the location of posting, candidates will also be eligible for DA, HRA and other allowances. Apart from the above basic pay, candidates will be paid DA, HRA and other allowances as per the rules of the Bank in force from time to time depending upon the place of posting. General Category candidates are required to pay an application fee of ₹600 whereas SC/ST candidates need to pay ₹150 for the same. Candidates meeting the stipulated norms only need to apply for the post. Application fee once remitted will not be refunded in any case. Step I: APPLICATION REGISTRATION; Step II: PAYMENT OF FEES; Step III: PHOTOGRAPH & SIGNATURE SCAN AND UPLOAD. So, Candidates can apply online through Bank website.